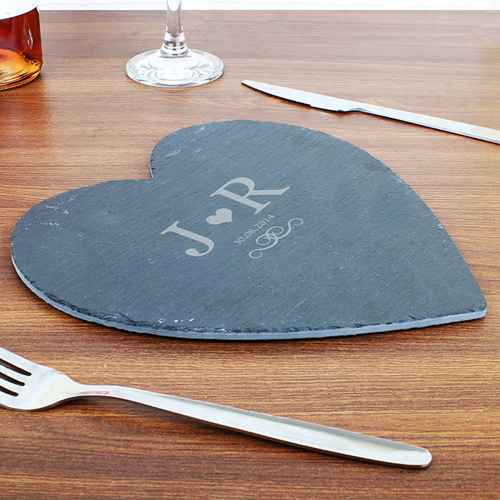 Personalise this Engraved Monogram Slate Heart Placemat with 2 initials and a date up to 15 characters. The heart motif is a fixed part of the design. Initials will appear how it is entered, if you require upper case, enter in this way when ordering. Decoration will come with an attached string, ready for use - colour of string may vary. Every hand cut slate piece will be slightly unique, this is due to the nature of slate. This could be by texture, cut or smoothness or through natural faults such as flaking or uneven corners. The piece of slate you receive may also feature speckles of fools gold. Personalise with 2 initials and a date up to 15 characters.